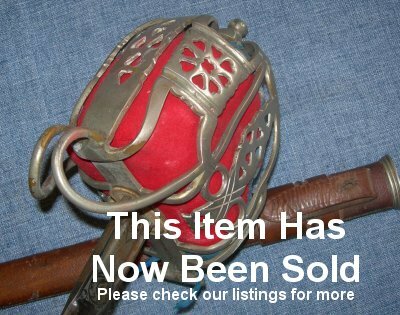 In good condition, a scarce World War One era Scottish infantry officer's broadsword. Almost certainly late World War One (1917 to 1918) as there are no maker markings to the blade (this was very common, as quantity over refinements was the order of the day). The 32 inch blade in very good order, with etching including the obligatory George Fifth royal cypher. Blade firm in the hilt. 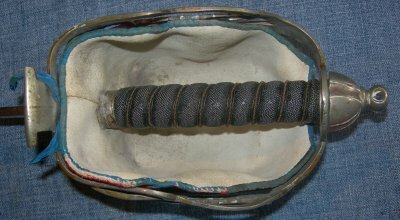 The hilt with some denting as is common. The fishskin grip and twisted grip wires in good order, the crimson liner still bright and fairly good. A good amount of the once Royal Blue edging (to the liner), still present. The leather field scabbard with correct ball chape old and a little worn and tired, but still sound, and the blade sheathes and draws well. Further / full-sized pictures available upon request. Item reference number A08(423-1).